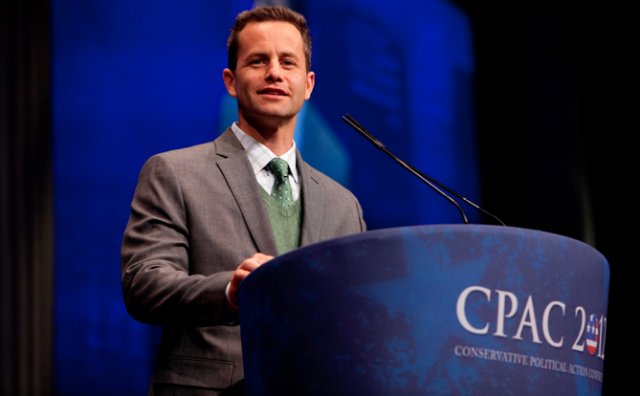 The acting career and preaching ministry of Kirk Cameron has been well received by Christians over the years. With movies such as “Left Behind”, and his television ministry, “Way of the Master”, Kirk has won the hearts of Christians throughout the country. His work has been a success in inspiring, and building up believers in their faith. However, Kirk’s latest film, “Monumental”, is taking a different, and confusing turn that is upsetting quite a few Christians. Yet, this change in Kirk agenda may reveal his own beliefs that have not been discussed over the last 13 years. To better understand this change in theology and agenda that Kirk is currently displaying in the media, let’s first take a look at his theology, and how it has played out over the years. The photos below are links that further explains the comments written under them. Here Kirk has affirmed the true gospel of faith in Christ, repentance, self-denial, and godliness. Kirk has exposed the false gospel of Mormonism. Through his leading role in the “Left Behind” films, Kirk has even affirmed the biblical belief that the world will be brought under God’s judgment, and that only Christ’s return to earth will bring about a world ruled by righteous judgment. However, it seems that there has recently been a change in Kirk’s doctrine, that has also changed his agenda. The change is in his refusal to live according to the belief that the world is under God’s judgment for its sins, by promoting the idea that America can be saved from its moral decay. Therefore, he is trying to convince Christians that they can reclaim America for God, which is part of the belief system of the American social gospel. Kirk’s reason for this decision is so that his daughters will have a better future in America when they are adults. However, this idea contradicts what Jesus said about the fate of the world until he returns (Matthew 24). Kirk is now willing to partner with false believers such as Glenn Beck, who is a Mormon, and David Barton, who is a historical revisionist that tries to deceive people into thinking that America’s founding fathers were devout Christians. Kirk is even willing to promote the false claims of David Barton, who has already been exposed as a liar, and a historical revisionist. The result of Kirk’s recent changes in theology and agenda will be confusion for those who believe everything that he teaches. For example: Kirk has taught the true gospel of faith in Christ, repentance, self-denial, and godliness. Now he’s teaching the social gospel of national salvation through political and cultural reform that falls in line with the American dream; in particular, liberty, which leads to liberation theology that teaches that Christians are allowed to take up arms against their government. Another example of the confusion that Kirk is causing is the belief that Christians must only affirm the Christ of the Bible, and the gospel message as is taught in the Bible. Kirk’s partnership with Glenn Beck, who is a Mormon goes against these two fundamental doctrines, since Beck does not believe in the same Jesus that is described in the Bible, instead he believes that Jesus is Satan’s brother. That is a false god, and the equivalent of an idol. Therefore, Beck is not a believer, but an idolater. Furthermore, Beck does not believe in the gospel of salvation as is described in the Bible. Instead, he believes in his ability to work for his salvation, and that faith alone cannot save him (Ephesians 2:8-9). The Bible forbids this kind of partnership. 11 But now I have written unto you not to keep company, if any man that is called a brother be a fornicator, or covetous, or an **idolater**, or a railer, or a drunkard, or an extortioner; with such an one no not to eat. To be led by Kirk is to be led into confusion, because there is now a gross inconsistency in his teaching and example. Also, his partnership with deceivers, such as David Barton, teaches God’s people that nothing is seriously wrong with working with teachers who bear bad fruit. However, this belief will come at the cost of leading people into not knowing who should be rejected because of their bad fruit, because if Kirk accepts certain false teachers, then why should any false teacher be rejected? The conclusion of the matter is this: Kirk has done plenty of good in the pass, and should be recognized for it, but now that he is partnering with the same people who Scripture has told the church to stay away from, Christians must now stay away from Kirk, who is now engaged in a monumental work of confusion.